The Ritx Carlton really is a magical place. My parents went there last summer and had a great time. 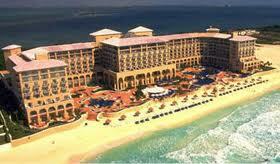 I also like The Royal in Cancun, it is one of the newer hotels in Cancun. It opened about 2 years ago. We were there to visit family and all though I never went pass the lobby area it was beautiful. My sister and her family stayed in ocean view room and have plans to return this year.